Yesterday, the MM6 Maison Margiela LFW presentation took place at the Mayfair pub, The Running Horse, though you would be hard-pressed to recognise it as it had been completely transformed. Every visible surface from the fireplaces and sofas to the entirety of the bar, had been completely covered in tin foil, in a nod to the aluminium adorned decor in Andy Warhol’s famed Factory. With models scattered around the venue, guests enjoyed pints (sadly not tinfoiled) while viewing the collection. 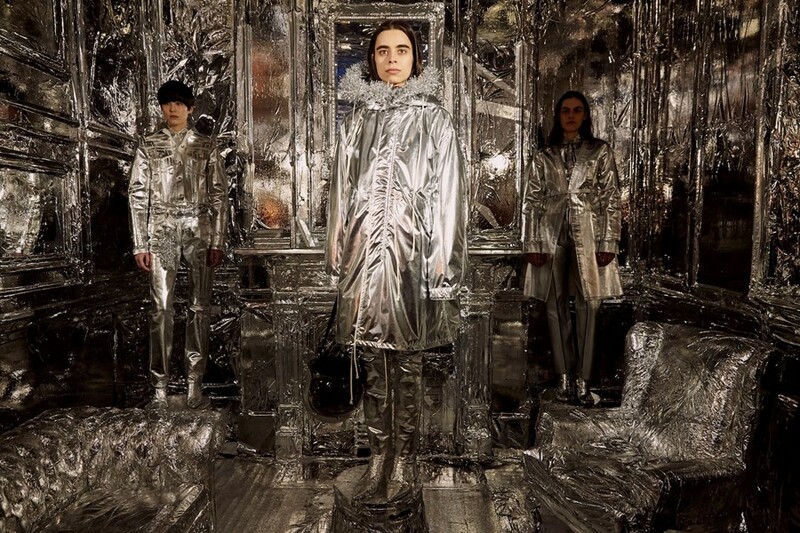 The looks – styled by Dazed’s creative director Robbie Spencer – matched the silvery scheme too, so the entire affair brought retrofuturistic references and some of the lesser-known Margiela motifs to the fore, with tinsel trim, spray painted shearling, pearlescent puffas, disco ball graphics (found in the Margiela archive) and chainmail like sequins featuring throughout. In addition to the collection, attendees could get their hands on a limited edition t-shirt that was created with a double silver foil treatment to tie into the theme. If tin foil chic is your thing, the one-off tee is available now at the MM6 London boutique.